Published: Nov. 26, 2017 at 02:36 p.m.
Indianapolis Colts safety Darius Butler and cornerback Nate Hairston share an interception. Published: Oct. 29, 2017 at 04:21 p.m.
Indianapolis Colts safety Darius Butler knocks the ball loose from Bengals RB Joe Mixon and linebacker Jon Bostic jumps on it for the turnover. Published: Nov. 6, 2016 at 06:25 p.m.
Indianapolis Colts cornerback Darius Butler intercepts Green Bay Packers quarterback Aaron Rodgers. 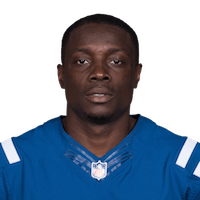 Published: Sept. 18, 2016 at 05:34 p.m.
Indianapolis Colts cornerback Darius Butler intercepts Denver Broncos QB Trevor Siemian for 19 yards.